At Higher Power Training, we literally go ballistic over balls. We have a lot of balls at HPT. We have med balls that go from 5 to 100 pounds. We have med balls that bounce, med balls that don’t, med balls on ropes and med balls with handles. Why so many balls? Because when you throw moderate to heavy balls as hard as you can, there is no deceleration phase, and this is called Ballistic Training- simply the best way to maximize power training for the upper body and core! Force and velocity have an inverse relationship. When lifting a one rep max (1RM), the bar will move slowly (high load=low speed). When squat jumping an empty bar, the bar will move quickly (low load= high speed).Therefore, you can’t train maximum strength and maximum speed simultaneously. We train the strength end of the curve (y axis) to develop power. 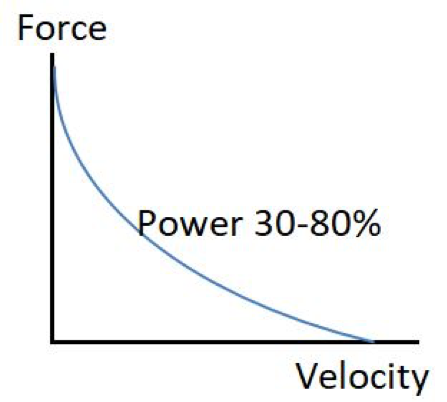 We can train the velocity end of the curve (x axis) to develop power. Power is best developed in the mid-point of the curve at 30-80% of 1RM. It’s not uncommon for two athletes to have the same 1RM but completely different bar speeds when squatting this load. The athlete that squats at a faster velocity will also perform a higher vertical jump. In sports and speed skills, the athlete with a higher bar velocity develops force at a higher rate. Whoever can apply force (strength) faster usually wins in sports. The rate of force development (RFD) of max strength is .4 seconds plus. 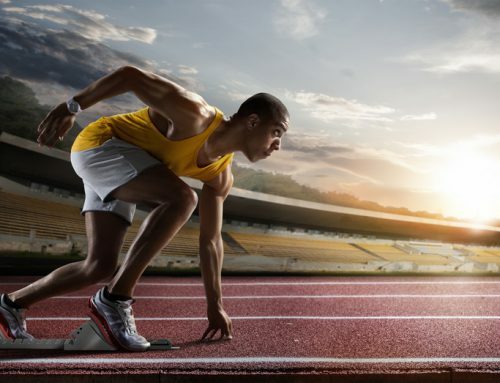 Sport movements occur much faster, usually a RFD of less than .1 or less than .2 seconds. For training to have the best transfer to sport, we need to learn to move loads with speed. One technique is accelerating lighter weights faster. The problem with this technique is you must stop at the end of the movement. 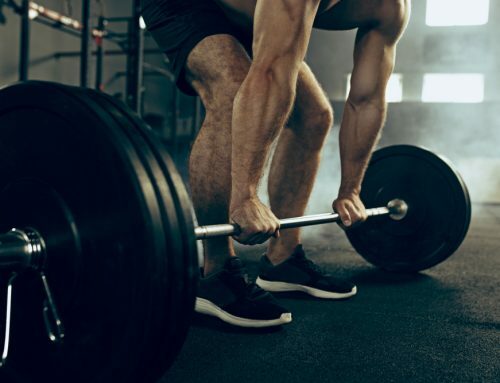 Research shows that when lifting a weight fast, approximately half of the time is spent decelerating the load. This is counter-productive. To properly train for optimal speed, we need to eliminate the deceleration phase. This is where ballistic training comes in. Ballistic training allows you to accelerate a load as fast as possible with no deceleration phase, allowing athletes to develop both power and speed-strength. Tossing or throwing medicine balls as hard and fast as possible is the best form of ballistic training for the upper-body and core. It is relatively safe for anyone, regardless of age. It is easier to learn than other power development exercises such as Olympic lifts, therefore saving training time. It can be used both to develop power, but also power endurance as a form of conditioning. It is loads of fun! Foundational exercises lay the groundwork for more complex exercises and should be the core of both strength- and ballistic-training. When adding med ball work, start by building the foundational patterns before moving on to more complex patterns. For example, with strength training, you should start with the basic bench press prior to adding 1¼ alternating DB chest presses. With med ball training, supine medicine ball (MB) catches and throws (or standing med ball chest throws) are better foundational options than kneeling MB chest throws (more advanced). Ballistic med ball exercises are a way of doing plyos with upper body and the core. Therefore, many exercises will be classified upper body or core. Although most exercises involve the lower body, the best way to develop the lower body power would be to add plyometric training. Although it comes down to semantics, communication is important at HPT. We like consistent nomenclature. Here is how we define tosses vs throws. Tosses tend to involve more of the core, or total body as a target muscle group. Tosses are long lever and single joint motions of the upper body. The arms are kept fairly straight and the motion is more of a swing, rotation, or a combination. Throws tend to be upper body dominant. They involve short levers and multi-joint motions with the upper body. The arms will bend then extend. Best performed with balls that don’t bounce. Use the whole body, not just the arms. Avoid this exercise with shoulder injuries or spine extension injuries. This exercise is used as a talent test for athleticism. Normative data exists. Use “dip and drive” as a cue. Be sure and bend your knees and keep your feet planted to maximize power. Best done with a partner, but you can throw to yourself. If using a partner, make sure they are not on a taller box than needed. Lock your torso and rotate from your hips and your ankles. Variations: Stay stationary, shuffle with the ball, throw, and 180% jump rotations. Use “bend and extend the elbows” as a cue. Variations: 2 feet together, split stance, Step and throw. Remember with med ball training, you get what you give. You have to throw the ball as hard as possible to get a positive training effect. When your reps slow down, it’s time to terminate the set. For power training, 30-80% has been shown to be ideal, but for ballistic training 50-60% is often recommended. Applying your 1RM will work well for supine med ball drops and push presses, but you will need to experiment for other patterns to determine what med ball weight is best. Now that you know more about ballistic training, get some balls and go ballistic.